Tag line: "She was everything the West was - young, fiery, exciting!" Trivia: Vincent Price was considered for the role of Doc Holliday. The Gunfight at the OK Corral was the single most famous showdown in the history of the American West. So, it stands to reason John Ford, Hollywood’s most prolific director of western films, would bring it to the silver screen. Shot in beautiful black and white, My Darling Clementine contains many of the director’s trademarks: the wide-open spaces of Monument Valley, the frontier folk music, exciting battles, and engaging high drama. He even manages to throw in a square dance for good measure. Wyatt Earp (Henry Fonda) is driving a herd of cattle through the territory with his brothers, Morgan (Ward Bond), Virgil (Tim Holt) and James (Don Garner). One night, Wyatt, Morgan and Virgil ride into the nearby town of Tombstone for a shave, leaving James behind to look after things. But when they return, their entire herd's missing, and James is face down in the mud, dead, with a bullet in his back. Convinced it’s the work of the Clantons, a vicious band of cattle rustlers led by Pop Clanton (Walter Brennan), Wyatt accepts the vacant position of sheriff of Tombstone, deputizes his brothers, and vows to stay on the job until he’s brought James' killers to justice. But the Clantons aren’t his only concern; as sheriff, Wyatt also has to deal with the drunken Doc Holliday (Victor Mature), a former surgeon with a quick temper who’s mighty good with a sidearm. When a trinket that belonged to James leads Wyatt to his brother’s murderers, it kicks off one of the most famous skirmishes in American history: the Gunfight at the O.K. Corral. As Wyatt Earp, Fonda is decidedly low-key, and much of the film is spent following him around as he performs the duties of his office. His Earp has a quiet strength about him, a calm determination to keep the peace, which he values above all else. He’s certainly not afraid of confrontation, either with the Clantons or Doc Holliday, and even tosses Chihuahua (Linda Darnell), a saloon dancer and Doc Holliday’s girl, into a horse trough when he catches her spying on his poker hand. Yet Fonda’s Earp remains a peaceful man throughout My Darling Clementine, drawing his gun only when circumstances demand it. On the other side of the coin is Victor Mature’s Doc Holliday, a risk-taker always ready for a fight (going so far as to challenge Wyatt early on, before the two became friends). At one time a respected physician , Doc is now content to live out his days playing poker and drinking whiskey. But his past catches up with him when Clementine Carter (Cathy Downs) rides into town. Clementine was close to Doc in the old days, and has come to ask him to return home, where he can be properly cared for. See, aside from being a gambler and a drunk, Doc also has tuberculosis, and is dying. Not willing to face Clementine, his past, or his illness, Doc jumps on a horse and rides out of town. The contrast between Wyatt Earp, who never backs down, and Doc Holliday, who's been running for years, brings a sense of irony to both their tumultuous friendship and the films climactic scene. The climax, of course, being the Gunfight at the OK Corral, which happens suddenly, and is over almost as quickly as it started. In fact, there’s a whole lot more sneaking around and getting set than there is actual gun play, and when the bullets start flying, they don’t do so for very long. Ford went to some lengths to ensure his interpretation was historically accurate; in laying out the particulars of the showdown, he relied heavily on a book written by Stuart Lake titled Wyatt Earp, Frontier Marshal, as well as a first-hand account of what transpired, which was given to him by none other than Wyatt Earp himself, whom the director met in his younger days. 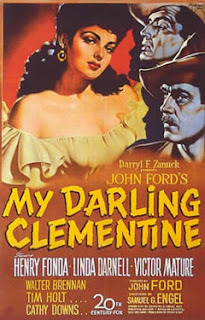 Ultimately, though, My Darling Clementine isn’t so much a chronicle of this important event in American history as it is the tale of two men thrown together by circumstance. That their story is more interesting than such a legendary battle is a credit to both Ford and his talented cast.